‘Tis the season for spreading peace, joy, and wellness. 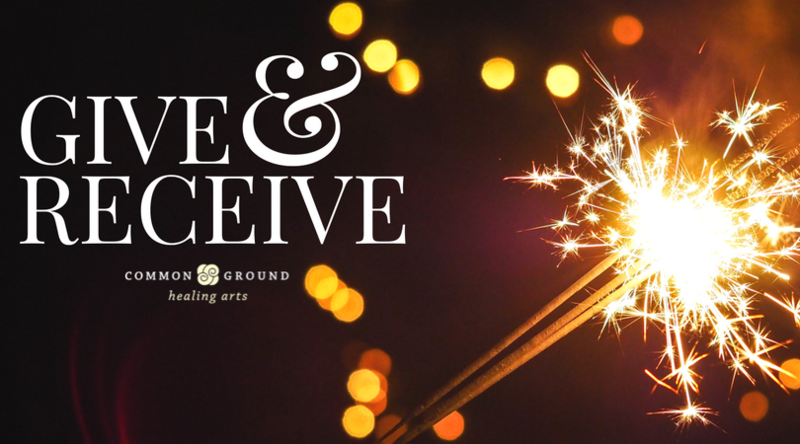 Common Ground has three holiday wellness packages to choose from to keep you and yours merry and bright. To purchase, call (434-218-7677), drop by, or buy them online from here. Please note: there are limited quantities of each of these specials (so shop early!) and all services must be rendered by the same client. Three amazing gifts in one. A great way to introduce someone to Common Ground or encourage them to try a new healing modality. Please note: the yoga class associated with this package occurs on Mondays, 5:30-6:45pm with Cynthia Woodring. Treat a loved one to some serious relaxation. Two massages, and one acupuncture sessions to ease tension and promote good health. Share the gift of decreased stress levels, relief from aches and pains, and greater flexibility. The compound benefits of frequent massage are a decidedly sweet way to show someone you appreciate all they do.